Take a trip back in time to Old Butler by visiting the BUTLER MUSEUM, located at 123 Selma Curtis Rd. in Butler. Many historical exhibits available for viewing. On the Museum grounds are other sites, including the restored STANLEY STOUT STORE from Old Butler, the VETERANS’ MEMORIAL and the MEMORY BRICK WALK. For information call 768-3534 or go to the website at www.butlermuseumtn.com. The Johnson County Pregnancy Center, located at 917 Crossroads Drive in Mtn. City, is currently open Monday, Wednesday and Friday from 10 a.m. to 4 p.m. The center is always in need of gently used small baby clothing up to size 18 months. Any gently used toys or equipment for babies and young children are welcome too. New moms also need personal items such as shampoo, soap, cleaning supplies, etc. and always appreciated are diapers and wipes plus all other baby need. Clients can earn a crib with 10 visits to their doctor. Clients can always get a free pregnancy test and the center offers limited ultrasounds with an appointment. For more information, contact Director Judith (Kip) Hoekstra at 423-727-8600. 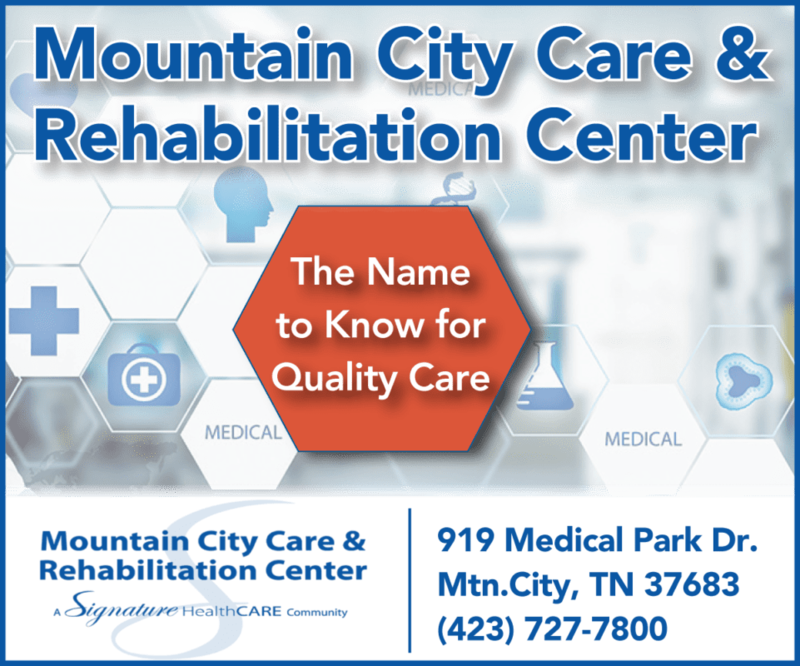 Call (423) 460-3330 or drop by the all-new Johnson County/Mountain City Adult Education Classrooms today- located at 372 Cold Springs Road (side entrance of the Department of Human and Child Services building). Classes are held four days a week, along with night classes to accommodate our working adults. Some students are able to earn their diplomas in less than a month. Classes are free and HiSet (GED) Testing is free. Take that first step towards changing your life today. Sarah Ransom, UT Extension Agent, teaches Arthritis Class every Tuesday and Thursday at 10:00am at the senior center. There is no fee for the class it’s offered FREE! You will have fun exercising and make new friends as well. Come and see for yourself. It’s always a great day at the Johnson County Senior Center. The Johnson County Farmers Market will hold its annual Holiday Fair Saturday, October 27, from 9am until noon. Not only will you find local fall produce, meats, and baked goods for your holiday meals but additional local hand crafted items including a variety of woodwork, bird houses, stained glass, pottery, jewelry, metal art, dried flower art, embroidered gifts, candles and more! There will be plenty of honey, jams, jellies, herbed vinegars, lotions, soaps, bath products, and other gift items.Come enjoy live music while you shop at the Farmers Market located at Ralph Stout Park. Come early for the best selection! 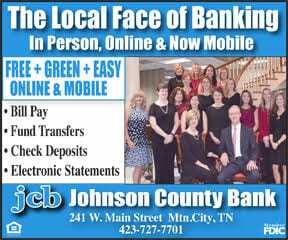 Call 423-727-5725 for more information. If you have a child that comes to the after school program at the JC/MC Community Center. Please fill out and return the paperwork for your child ASAP. We need this paperwork to continue with our program. It’s time for “Scarecrows on Main”! Scarecrow exhibit dates will be from October 10 through the 31. 1st, 2nd, and 3rd place prizes will be awarded, as well as “People’s Choice”. Please cast your vote for the “People’s Choice” at City Hall from Monday, October 15th through Thursday, October 25.The winner will be announced on October 26. If you would like more information, please call 423-727-8005. Honey, watermelon, grapes, decorative pumpkins, gourds, butternut squash, tomatoes, leeks, eggplant, sweet peppers, hot peppers, kohlrabi, potatoes, cabbage, beets, Swiss chard, arugula, kale, collards, mustard greens, salad greens, onions, garlic, and herbs. You’ll find all cuts of pasture raised beef and pork, chicken eggs, fresh roasted coffee, raw milk, apple cider vinegar, kombucha, sauerkraut, apple butter, chow chow, jams, jellies and other home canned products.Our bakers will have breads, muffins, quiches and more. There will also be a variety of hand made craft items. Bring the kids to participate in our GoJoCo kids Club activities and they will receive some tokens to spend at the market. Our Fresh Savings Program gives double dollars from an EBT card that allow for free fruits and vegetables.Come enjoy the live music each Saturday morning through October at Ralph Stout Park near the playground from 9 until noon. Heritage Hall Theatre ushers needed. If you love people, this is a rewarding Volunteer Community Service. Mark your calendar for Sunday October 21st for the Usher Training Class at 1:45 pm at HH Theatre. This class is to refresh current ushers as well. For questions call De Lite 727-7131. Positive Thinkers will be taking applications for Santa’s Helping Hands on Tuesday, October 16 and Thursday, October 18 from 5 pm-7 pm at Mountain City Elementary School. Parents need to bring proof of income, proof of residency and identification. This will be the only time that applications will be taken. This program is for children under 12. Names are not chosen on first come, firs serve basis and not all that apply can be helped. Santa’s Helping Hands is here to help families who need a helping hand at Christmas. Meetings are open to anyone and any organization. Membership is free and open to anyone supporting the mission of the Coalition. Meetings are held on the third Tuesday of every month from 11:30 a.m. to 1 p.m. at the Johnson County Mountain City Community Center. Lunch is provided. Republican Women to meet on Oct. 18 at 12 Lunch and 12:30 Meeting at the Johnson County Library. Please know the there will be no Bathroom available due to construction, Plan accordingly. E-mail for Honey-Bees current menu choices. gbellhome@gmail.com. See you there bring a friend. The Tennessee Sunrise Quilt Guild will meet Sat., Oct 20th at 10:00 AM in the Fellowship Hall of the First Christian Church. Anyone interested in quilting and sewing is welcome to attend. We will be given instructions and begin work on sewing a Christmas Tree Wall Hanging of our own. As always you are encouraged to check out our website www.tnsunrisequilters.com to see what we are doing. Johnson County Historical Society will meet on Sunday October 21,2018 at 2PM in the lower level of the Johnson County Welcome Center. The Lecture Series will continue with a presentation of A Chronology of Agriculture and How it relates to Johnson County.given by B.C. Stout. This series is free and open to the public. Light refreshments will be served. Johnson County Center for the Arts is your destination for locally made art and fine craft from the East Tennessee Mountains. More than thirty juried artisans sell their wares through our gallery space. Most days, you’ll find at least one of them painting, carving, or quilting. You can sign up for scheduled classes or use the materials in our Maker Space anytime. Volunteers are always ready to help get you started. We serve coffee and pastries.“ART is for ​Everyone!” Cristy Dunn will teach this series of 8 classes. Students will complete a charcoal portrait and a still life painting in oil as they learn about the elements and principles of art.. The cost is $10 per class for adults and $5 per class for students 21 and under. Scholarships are available if there is financial need. Contaact us to reserve your spot. Subsequent classes will be held tentatively October 26, November 9, 17 and 23, and 30. October’s featured artist is Kay Braswell. The johnson County Senior Center will be sponsoring an 8-Ball Tournament on Wednesday, Thursday, and Friday (Oct 17-19) for members of the Center. There will be separate divisions for men and women. First and second place trophies will be awarded in both the men’s and women’s divisions. Complete rules are posted in the pool table area of the Senior Center. An optional “Rules Meeting” will be held on Tuesday, October 16. The men will meet at 12 noon and women will meet at 2pm. There is no required entry fee for the tournament but a $5 donation is requested to help cover the cost of the event. The registration and/or withdrawal deadline is 12 noon on Friday, October 12. Johnson County Historical Society will meet on Sunday October 21at 2 PM in the lower level of the Johnson County Welcome Center. The Lecture Series will continue with a presentation of Early Practices of Industry in Johnson County given by Mary Nave and B C Stout. This series is free and open to the public. Light refreshments will be served. The Trade Community Center will be holding a Harvest Dinner on Saturday, October 27. Get country breakfast from 7 am to 10 am. Adults: $5, Kids 5-12: $4, 4 & under: free. Shooting match for stock guns with cash prizes 10 am. Spaghetti Supper 4 pm- 7 pm. Adults: $5, Kids 5-12: $4, 4 & under: free. DJ playing starting at 7 pm. Big Gun “2-2-10” shotgun shoot at 6 pm. Halloween costume contest 7 pm. 12 & under category prize: $25, 13 & over category prize: $25. Tool raffle drawing for Poulin 18 in. chain saw, 128pc metric tool set, trailer buddy, jump starter, post puller, ratchet set and more. For more information, call Bill Roark at 423-895-2213. Evelyn Cook will be the featured storyteller at the senior center on Monday, October 29 at 11:30 a.m. She will be telling “Ghost Stories of Shady Valley.” Anyone 60 or older is invited to come and hear the story. Storytelling is offered the last Monday of every month. Past storytellers include Minnie Miller, Rick Ward from North Carolina, Brenda Johnson, Flo Bellamy, Lois Dunn, and Junior Maze. Most of the stories have an Appalachian flavor and often include local history or local folklore. Anyone interested in telling a story should contact Minnie Miller at 727-6993.